Q: I read about the admirable properties and low cost of rice hulls, a waste product apparently available for purchase (+/- $6.00 per ton) at rice mills in a number of states. High in mineral content, the husks are a good insulating material and relatively fireproof. Such a material sounds like a good possibility for filling bags to make an 'earthbag' shelter, except that the rice hulls would be lightweight, possibly easier to handle for anyone with limited assistance in building their home, or building in an area where they do not want to disturb the ground in order to obtain earth to fill the bags. Is there any reason you can think of why such an alternate filling for the bags would be a poor idea? A: I would think that under certain circumstances earthbags could be filled with rice hulls, and that this would create a very insulated wall, since there would be a lot of air space around the hulls. You might not want to use these bags in a situation where they would be load-bearing, because they might compress too much, but as infill in a post and beam structure they should work fine. Q: Do you have any idea where we can find rice hulls in the NY area? A: I'm not sure about finding rice hulls in NY. Mainly these are available where they do the processing of rice, which is generally in the southern states I believe, like Texas and Florida. It might take some Googling to find a source close to where you are. Q: Do you have any recommendations regarding using rice husks? We are a rice producing nation, and these husks are usually gathered up and burned--obviously both a waste and a contaminant to the environment. A: I have not experimented with filling the bags with rice husks, so I can't speak from personal experience. They do seem to be an excellent choice from almost every standpoint. They are obviously going to compact more than most mineral materials would, so you need to take this into account (but then so do strawbales, and people do build load-bearing structures with them). Also, I would be especially careful to protect rice-filled bags from getting wet, as I am sure the husks are more prone to rot than mineral materials. The advantage is that they provide excellent insulation. Q: I can't find scoria nearby. I'm a little worried about the stability of the rice hulls since they are lighter and less clay like, but rice hulls seem to be a much better insulator and they're lighter so those are big benefits. A: You might think of the lightweight rice hull bags as being used like the interior foam insulation of a structural insulated panel, with a soft core and more solid skins on either side. In this case the skin would be mesh-reinforced plaster. This technique could be stronger than you might imagine. Q: My husband and I live in South India, where the weather gets really extreme. It's very hot much of the year, then we have monsoon season, where the rains are very heavy all at once (for 2 months a year or so)...Here's my question(s): Will an earthbag home do well in this kind of weather? Will the home stay dry and cool inside? 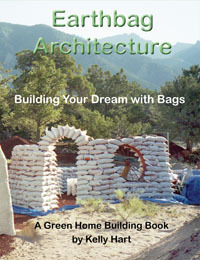 A: Yes, an earthbag home could work well in your climate, but would best be well insulated to avoid too much heat. Some houses in Thailand have recently been built with rice hulls used to fill the bags, and these are highly insulating and rot resistant. If the bags are filled with soil, then there should be some additional insulation on the outside. It is important to have a good roof with a large eave to protect the walls.